Welcome, fall! We’ve been waiting for you, and we’re ready to celebrate all month long. Take a hayride, tour the ranch, enjoy live bluegrass music, and choose a pumpkin at the pumpkin patch. Other activities include a petting zoo, Cave of Confusion, and crafts at various vendor tents. Learn more here. Celebrate the local apple harvest with food and drink vendors, music, crafts, artists, and more. Get more info here. Play games, enjoy crafts, snap pics at our green screen photo booth, and indulge in some sweet treats. Costumes encouraged. Register here. 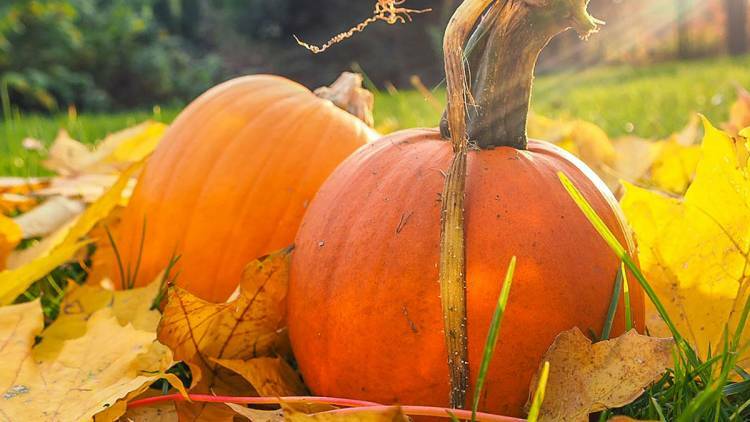 Enjoy fall activities at the farm, including pumpkin picking in the patch, pony rides and horse-drawn hayrides, photo booths, barrel train rides for kids up to age 12, a mini-maze for kids up to age 10, and much more. Get more info here. Navigate through seven acres of corn, then visit some barnyard friends, explore the treehouse and water feature in Deer Creek Discovery, and more. A mini-maze is available for kids 10 and younger. Get more details here. Find your way through two corn mazes, including a mini-maze for kids, and enjoy farm animals, a bouncy castle, barrel cart rides, a hayride to the pumpkin patch, on-site food vendors, and more. Learn more here. The whole family will have fun at the library’s annual autumn festival featuring seasonal games and crafts, tasty treats, and some spooky science. Costumes are encouraged. Register here. The farm festival experience includes a corn maze, haybale maze for kids, duck races, bounce houses, petting zoo, and much more, plus a pumpkin patch. Get more info here.